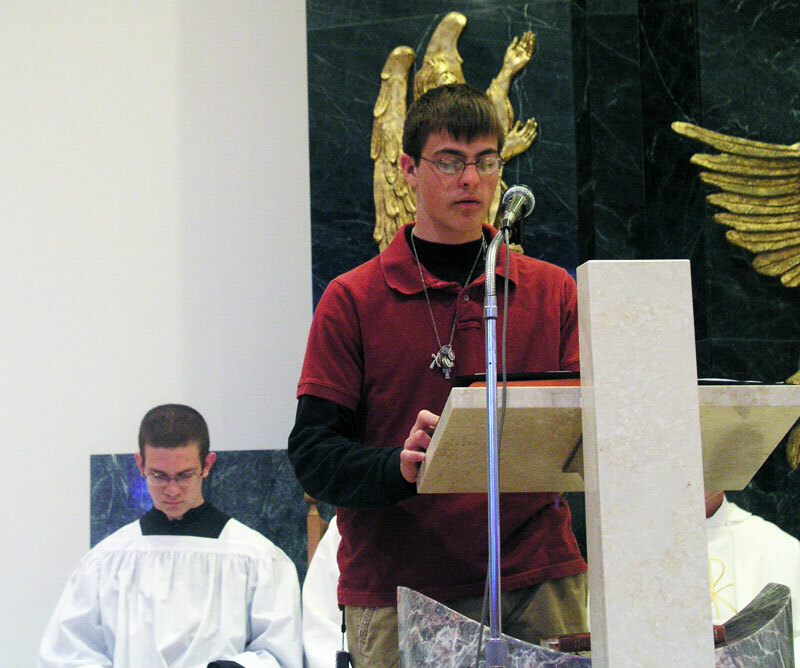 NEW YORK—Even before they traveled from Indianapolis to New York to see Pope Benedict XVI, Michael Kubancsek, 17, and Peter Jansen, 18, already had an interest in the priesthood. After hearing the pope speak at a youth and seminarian rally on April 19 at St. Joseph’s Seminary in Yonkers, N.Y., they left with a clearer vision of what a vocation to the priesthood might require of them. Peter has a similar feeling. “I considered it [the prieshood], listened, and my prayer remains to be open to whatever God wants of me,” Peter said. A major element of Pope Benedict’s talk to the youths and seminarians focused on the increased discernment of young people to religious life. “Strive for a pattern of life truly marked by charity, chastity and humility in imitation of Christ,” Pope Benedict said. It is the element of service that interests both youths in their discernment of the priesthood. Michael uses the Holy Father as his greatest example of service and devotion to the Church. “For me, Benedict as a man, pastor and pope has embraced his role as vicar of Christ and as a shepherd for Christ,” said Michael, a member of Our Lady of the Greenwood Parish in Greenwood. Peter sees work that still needs to be done in the Church. He sees a message that still needs to be spread to those who believe and to those who do not. “Leading people back to the faith is an important element for me,” said Peter, also a member of Our Lady of the Greenwood Parish in Greenwood. The pope’s message of hope also inspired both teens. Michael sees a direct correlation between hope, the administration of the sacraments and the priesthood. Father Jonathan Meyer, director of youth ministry for the archdiocese, sees these two teenagers as youths who impress him in their faith. He credits this to great personal prayer and a solid family base of Catholic teaching. Father Meyer realizes that the discernment process can be difficult for any young person deciding on a vocation. That is why he reminds everyone to use techniques like prayer to help with the process. “Personal prayer is so important. You find your vocation in silence,” Father Meyer said. Pope Benedict said that another guiding tool in the discernment of a call to religious life is taking the time to develop relationships with those who are already ordained. “No perfect community exists, but I encourage you to speak with brothers, sisters and priests about religious life,” Pope Benedict preached. Peter hopes to be a seminarian in the fall at the Bishop Simon Bruté College Seminary in Indianapolis. As a seminarian, he would take classes at Marian College in Indianapolis. Michael, a junior at Center Grove High School, also is considering becoming a seminarian in the future. He also remains open to other options, and thinks his service to the Church is what is most important right now.